This is our decadent take on the humble nut loaf. 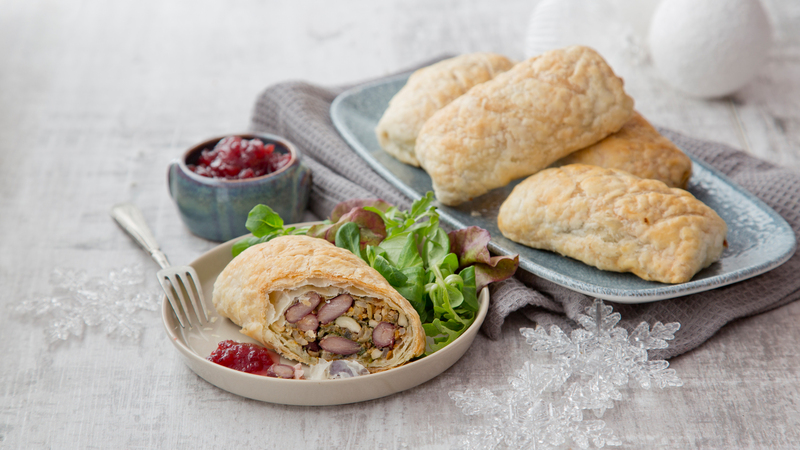 With chestnuts and sage in a delicious golden Wellington pastry, served with cranberry sauce and gravy, it’s perfect for dinner and entertaining. 1. First toast the cashews by putting them in a small dry pan set over a medium-high heat. Dry roast them for 5 to 8 minutes, stirring occasionally and making sure they don’t burn, until golden. Tip out onto a plate to cool down. Roughly chop two-thirds of the cashews along with all of the chestnuts or pulse them in a food processor until finely chopped. Set aside. 2. Heat the 2 tablespoons of oil in a large frying pan or pot on a medium heat. Add the onions and ¼ teaspoon of the salt and sauté for 4 minutes, until they start to turn translucent. Add the garlic and cook for a further 2 minutes, stirring regularly. Add the carrots and parsnip and cook for 5 more minutes, stirring regularly. Add 2 or 3 tablespoons of water if needed to keep the mixture nice and moist. Remove the pan from the heat. 3. Add the chopped nuts to the pan along with the tamari or soy sauce, the remaining 1 teaspoon of salt, the black pepper and a pinch of cayenne. Mix well, then add the remaining whole cashew nuts along with the kidney beans and spinach. Stir until the spinach has wilted slightly from the residual heat. Add the cooked rice or quinoa to the stuffing, then taste and adjust the seasoning if you think it needs any more salt or pepper. 4. Put the pan back on the heat. Stir in the chopped thyme and sage and cook through for a couple of minutes, stirring, until the mixture is warm and well mixed. This will bring all the flavours together nicely. Take the pan off the heat and allow to cool. 5. Preheat the oven to 180°C/gas mark 4. Line a baking tray with non-stick baking paper. 6. To assemble, lightly dust a work surface with flour. Unroll your defrosted puff pastry sheet onto the work surface and lightly roll it out using a rolling pin to make it slightly larger. 7. Put the filling in the centre third of the pastry, leaving a third of the pasty clear on either side and also leaving a little space on each end so that you can properly seal your wellington. Form the filling into a smooth mound. 8. Bring the pastry around the filling from both sides and both ends so that it covers the filling completely to make a neat sealed parcel that the pastry overlaps. Carefully transfer to the lined baking tray, turning the Wellington over so that the seam side is down. Lightly score the top of the pastry in a diagonal pattern to form a criss-cross effect, then use a pastry brush to brush all over with oil to give the pastry a golden brown colour. Use the tip of a sharp knife to cut a few small slits in the top to let the steam escape. 9. Bake in the oven for 25 to 30 minutes, until the pastry is golden brown and the kitchen smells fab! Serve with gravy and cranberry sauce on the side for a magical meal.